...from the North Texas e-News. Fort Worth Stockyards, Texas. 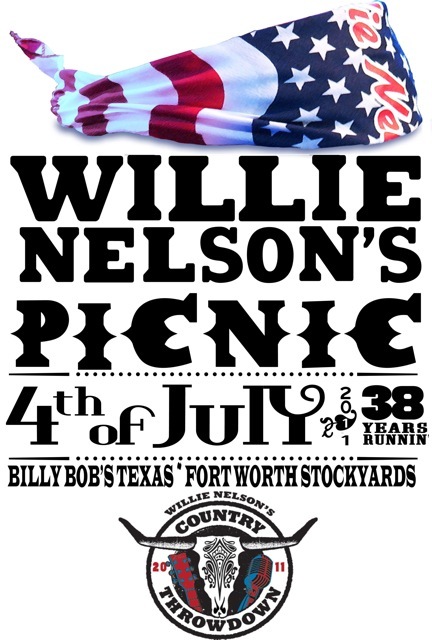 – Billy Bob’s Texas announces the return of Willie Nelson's 4th of July Picnic to Fort Worth. The Fort Worth Stockyards hosted the iconic “Willie's Picnic” in 2004, 2005 and 2006. Willie is currently on the Country Throwdown Tour 2011 which will wrap up with the always-anticipated Willie Nelson’s annual 4th of July Picnic. The long-standing Texas tradition will break new ground as it will be held outside and inside of the famed Billy Bob's Texas. Headliners at Willie Nelson’s 4th of July Picnic & Throwdown will perform on the venue's main stage outside with many artists taking the stage indoors for a full complement of multi-talented entertainers. Willie Nelson’s 4th of July Picnic & Throwdown is designed to provide guests a not-to-be-missed afternoon and evening of exceptional performances by artists from all musical genres, along with some unexpected jam sessions. Country Throwdown tour artists include Willie Nelson, Jamey Johnson, Randy Houser, Lee Brice, Craig Campbell, Lukas Nelson & Promise of the Real, and Drake White. Willie’s Picnic will feature many artists who are traditionally featured on the Willie’s Picnic lineup, including Ray Price, David Allan Coe, Paula Nelson, and more. This year's unique setup will feature the air-conditioned comfort of Billy Bob's opening to the landscaped beauty of Rodeo Plaza in the Stockyards. Doors will open at 11:30 a.m. with the first artist taking the stage at 12 p.m.
Tickets will go on sale May 2 at 10 a.m., $30 in advance/$35 at the gate, will be available through www.ticketmaster.com, and through Billy Bob’s box office 817-624-7117. Because of the unique inside/outside nature of this year's event, it will be the first time that “Willie’s Picnic” in Fort Worth will set a ticket and headcount limit, and organizers are expecting a quick sellout. "Willie Nelson's 4th of July Picnic is a long-standing tradition, and we’re thrilled to be a part of it. We couldn’t think of a better way to end this tour than by bringing together the legendary picnic talent with the big-name artists performing throughout the Country Throwdown Tour,” said Kevin Lyman of 4Fini. “Billy Bob's in Fort Worth is known as the World's Largest Honky Tonk, so I can’t think of a better place to host this year's finale." The tour also is known for spotlighting emerging singer-songwriters on the Bluebird Cafe Stage. Adam Hood, Caitlyn Smith, Austin Lucas, Brent Cobb, Dani Flowers, and Erin Enderlin have signed on for this special tour attraction, giving fans the opportunity to hear some of Nashville’s best in the “in-the-round”-style sets made famous at Nashville's Bluebird Cafe. This unique singer-songwriter showcase will be a first for Willie’s Picnic in Fort Worth. For more information about Willie's Picnic event, visit www.billybobstexas.com, www.williespicnic.com. 817-624-7117.